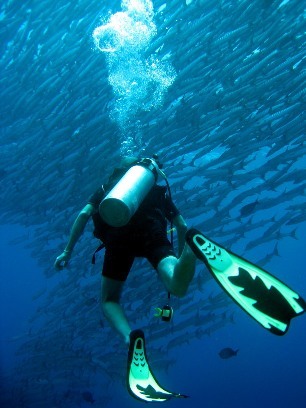 The Adventures in Diving program offers both the Adventure Diver and Advanced Open Water Diver certifications. If you complete any three adventure dives, you can earn your PADI Adventure Diver certification. If you complete your Deep Adventure Dive, Underwater Navigation Adventure Dive and three Adventure Dives for a total of five, you can earn your Advanced Open Water Diver certification. Have you always wanted to try underwater photography? How about wreck diving? Here's your chance because you can sample three dives of your choice, get a taste of what you like, and feel more comfortable in the water, strengthening your underwater skills and letting you enjoy diving more than ever. Certain limitations apply for divers 10yrs or 11 yrs old. You only need 1 day to complete this course during which you will complete 3 of the above dives guided by one of our instructors. The PADI Adventures in Diving manual and corresponding slate all come as part of the course package. After your PADI Adventure Diver certification you can take the next step by completing two more adventure dives. If you've completed five total adventure dives that include deep and navigation, you're an PADI Advanced Open Water Diver. PADI Adventure Dives can also count towards PADI Specialty Diver certifications. If you liked your Night Adventure Dive so much that you wanted to take a complete PADI Night Diver Specialty course, your Night Adventure Dive can count as the first dive of that specialty. Hotel Sipadan Inn Semporna Resort Township Semporna, Sabah, Malaysia.